Yet another price drop for the Kessel Run Millennium Falcon. Now featured as Amazon’s Deal of the Day at $20.99. This might not be the best collectible or display piece, but it’s hard to deny that price if you are looking for a ‘big’ present to stuff under the tree for your wee padawan. Or, maybe you just want a $20 Han Solo that comes with a free Millennium Falcon. Or, maybe you just like to blow things up and now this fits in your price range for cannon fodder. Click through to take advantage of this deal! ← TARGET Online Has The 6" Range Trooper For $7.14! Is this a new low? Check out the Target.com listing for the Kessel Run Millennium Falcon, coming in at just $29.99. ← Emperor's Royal Guard Jumbo Vintage Kenner Figure For A Low Price Today! Kessel Run Millennium Falcon, Not The Kessel Run Han Solo Blaster, Please! If you took advantage of that crazy online deal at Michaels Kids for the Kessel Run Millennium Falcon, you might be in for some disappointment. We are receiving reports that people are receiving the Han Solo role-play blaster instead. We’ve also heard that people have called customer service and Michael’s is sending out corrected order 2nd-day air. So, let us know of your experience int he comments. Special thanks to friend and JTA reader Matthew D. for the report! Wow! 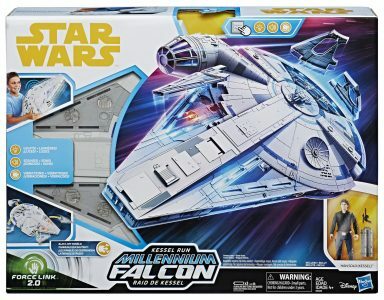 Get the Hasbro Force Link 2.0 Kessel Run Millennium Falcon with exclusive Han Solo figure for around $33. Michaelskids.com has it IN STOCK for $40, but use promo code STORE40W to get 40% off which brings the item down to $24 and also cancels out the shipping and tax, bringing it to around $30-$33. Special thanks to JTA reader Greg G. for the news! Kessel Run Millennium Falcon Han Solo Without The Millennium Falcon! If you want the Han Solo figure from the Kessel Run Millennium Falcon, but don’t want the ship or want to pay $100 for it, tunghori is selling the figure loose for only $9.99! ← BB-8 2 In 1 Mega Playset Only 75% OFF On Amazon! We’d like to thank Hasbro and Litzky PR for providing us with the Kessel Run Millennium Falcon review sample from the Star Wars [Solo] line. Learn all about it in our Research Droids Reviews today! Be sure to leave your thoughts in our comments section, vote in the poll or even comment about it on our Facebook page. Click the banner below for the direct link to the review! As always, you can also send your review requests via email if you’d like to see something that we didn’t cover yet.